Description: No Silversmithing experience is required. This class is for beginners or a refresher for everyone, please be prepared to focus and work hard. 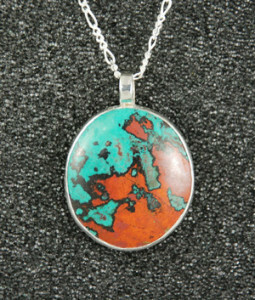 Students will make 1 bezel set stone pendant with a bail. Students will need to supply 1 small to medium cabochon. Students may bring personal tools if desired. Cabochons may also be purchased at class - please contact the instructor with any questions. Student who have already taken this class can work on a more advanced project of their choice in silversmithing. Materials fee: Paid to the instructor. Sterling silver kit is $35.00 which includes 2" x 2" sterling silver sheet 20 gauge, 1 foot 1/8" bezel wire and a pack of 3/0 saw blades. Contact the instructor for details if you would like to bring your own materials. Please Note: material fees may fluctuate due to rising and lowering of silver costs at the time of ordering. To register for this class: Click "Register Now" or contact the instructor, Donna Madej, at donnajmadej@gmail.com or call 410-215-1774. A minimum of 3 students is required for this class to run, and class size will be limited to 8 students. Please note that only PLG members may register for classes; a "Member Signup" link is at the top of the page. If you are a member and do not see the Register Now button, please ensure that you are logged in. Please sign up BEFORE May 3rd, so you materials can be ordered. Your place will be reserved when you contact the instructor and receive a reply. If you cancel after the date above or "no show" you will still be responsible to purchase your kit.